Cooked Long Grain Rice Topped with Cooked Diced Chicken Breast and Aromatic Curry Sauce. 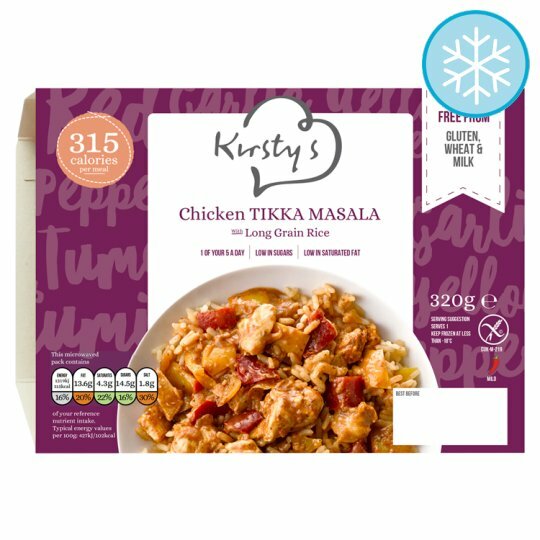 Hello... We're Kirsty's, a small but passionate bunch with a simple idea, to make free-from food that is nutritious, delicious and satisfying. We believe that the food we eat is intrinsically linked to our emotions and how we feel on both the inside and out. It's not always easy to eat the right things, particularly if like my son you suffer with food allergies. So that's why we've thoughtfully created our recipes to help you feel good every day. Cooking Instructions (General): For best results cook from frozen. The following instructions are guidelines only. Ensure the product is thoroughly cooked and piping hot before serving. Do not refreeze after defrosting. 1. Remove outer sleeve and pierce film lid several times. 2. Place on a microwaveable plat and cook for 4 minutes. 3. Peel back film lid and stir thoroughly. Cook for a further 2 minutes. 4. Stand for 1 minute before serving. Oven cook (From Ambient): 1. Preheat oven to 200°C (Fan 180°C)/ Gas Mark 6/ 400°F. Remove outer packaging and pierce film lid several times. 2. Place on a baking tray near the top of the oven. Cook for 30 minutes. 3. Remove film lid, stir gently, return to oven for further 10 minutes. 4. Allow to stand for 1 minute. Stir before serving.